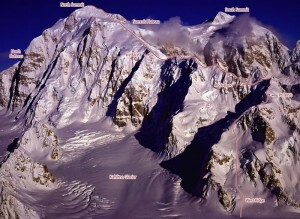 Although not technically the easiest route to the summit, the West Ridge was chosen the first ascent route and is considered the standard route to the summit. But don’t be deceived, this is not a “dog route.” The route and the mountain are a serious undertaking, considered much harder than its two higher neighbors. The climb is classically Alaskan, presenting a variety of climbing types. Offering rock, mixed, ice, and dazzling corniced ridge climbing, the route is constantly thought provoking. And unlike many climbs in the range, there is no easy way down. The climb gets attempted about a half-dozen times each season. The success rate varies dramatically with the year’s snow conditions. The mountain has in the past gone several years in a row without a successful ascent. In addition to the standard route, there has been much interest lately in a variation that is purported to be the easiest route up Mount Hunter—the Ramen Route. This route is also covered in the book. Which SuperTopo guidebooks include a topo for West Ridge?